The Richard Mille RM 25-01 Tourbillon Adventure Sylvester Stallone is a chronograph with tourbillon inside a 50.85mm watch case that’s fitted with a removable compass bezel. 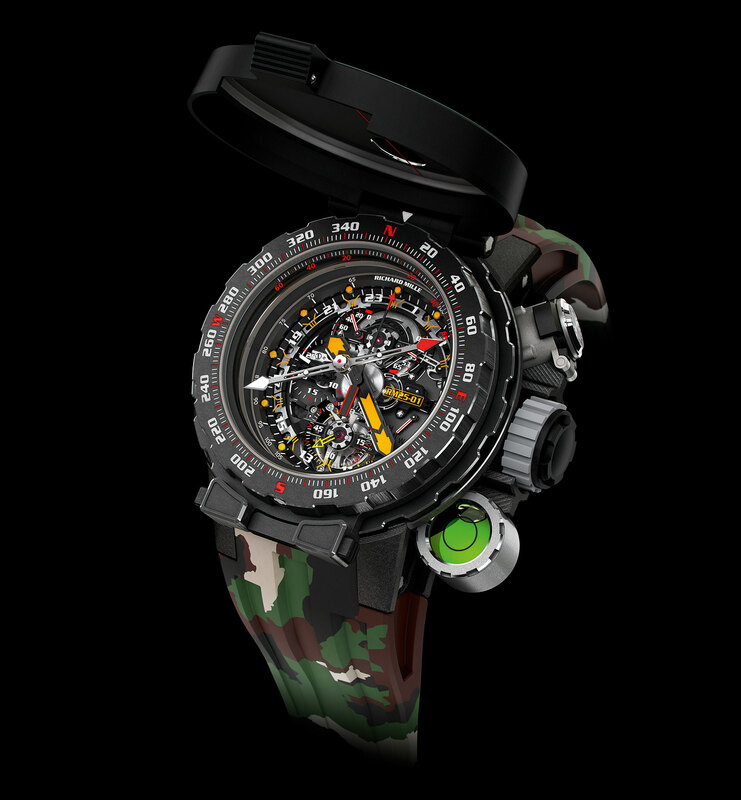 Priced at a shade under US$1m, the watch was designed in collaboration with Sylvester Stallone, presumably nostalgic about his outing as John Rambo in First Blood. 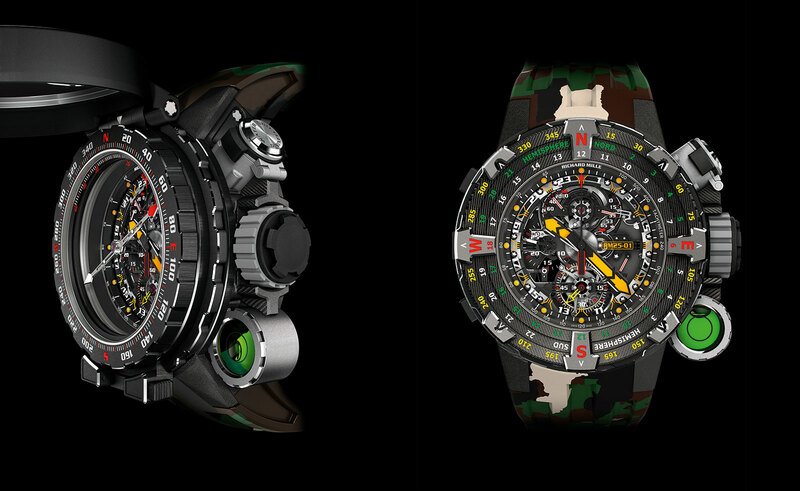 Notably, the RM 25-01 Tourbillon Adventure Sylvester Stallone isn’t the first watch designed by the action movie star. Mr Stallone was also responsible for a series of watches (and also pens) made by Italian pen maker Montegrappa. Covered in snakes and skulls, those objects were of a radically different school of design from Richard Mille’s latest creation. The enormous watch case is made of Carbon TPT, a carbon fibre composite made up of alternating layers of carbon, explaining the woodgrain surface pattern of the material. “TPT” is short for Thin Ply Technologies, the Swiss materials firm that supplies the raw material for the case. 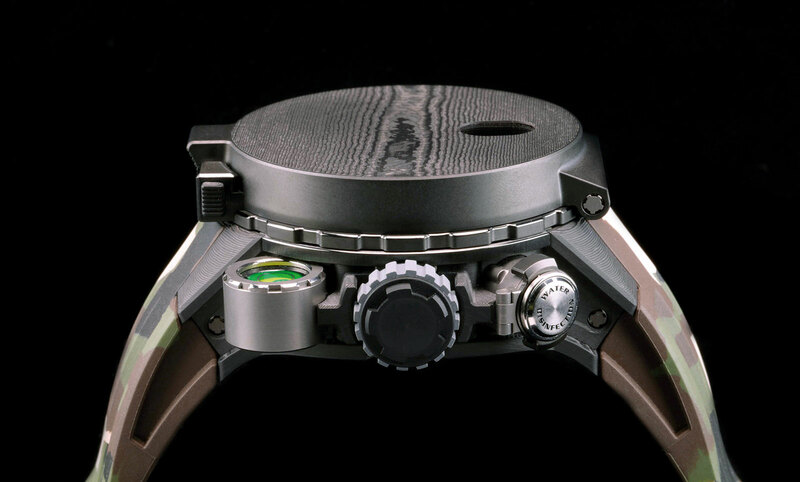 What sets this apart is the compass bezel, which is removable and made of titanium. 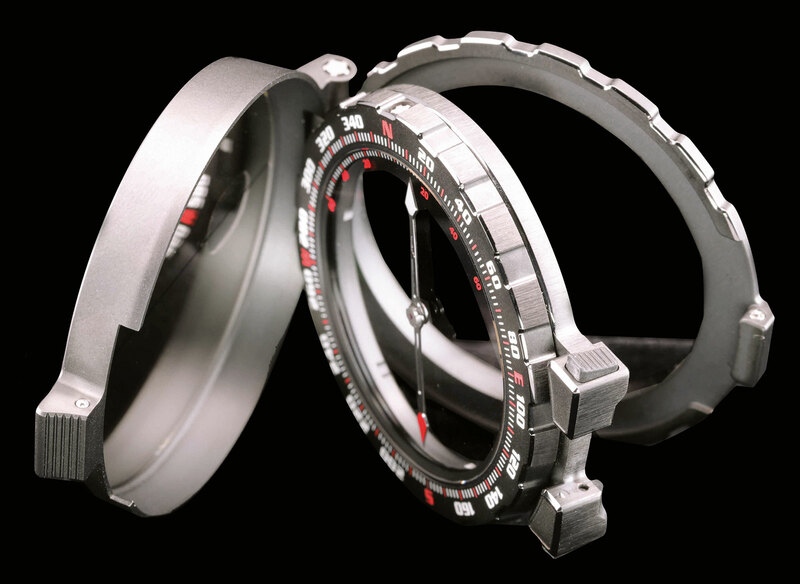 Set in a bayonet mount – which means twist and push to lock or unlock – the compass has a hinged lid in Carbon TPT with a mirrored back as well as an anti-magnetic coating on its crystal to prevent the magnet on the compass from affecting the movement. 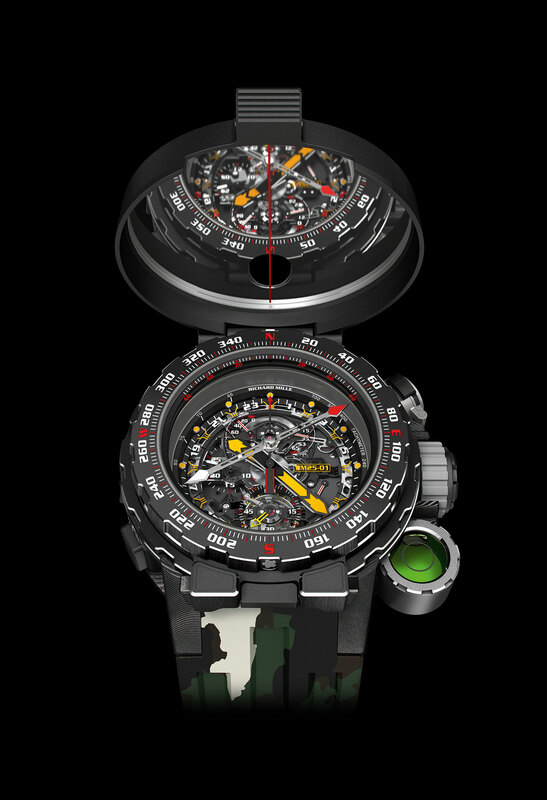 The green capsule attached to the watch case at four o’clock is a spirit level that can be used to ensure the watch is perfectly horizontal when using the compass. And another handy accessory is a titanium frame – the detached compass can be mounted on the frame and laid flat on a map for navigation. The magnetic compass bezel can be removed and swap for a second manual compass bezel that’s also made of titanium and Carbon TPT. This is covered with a 24-hour and 360 degree scale, and used in conjunction with the hour hand to determine the cardinal points relative to the we are. Based on the original RM 025 of 2009, which was a chronograph tourbillon for divers, the Stallone wristwatch relies on the same base movement supplied by Renaud & Papi. It’s a hand-wound chronograph calibre with a tourbillon regulator, finished in typical, monochromatic Richard Mille style and designed with an aggressively mechanical aesthetic. The movement has a 72-hour power reserve, as well as a power reserve display and function indictor that reveals what position the crown is in. 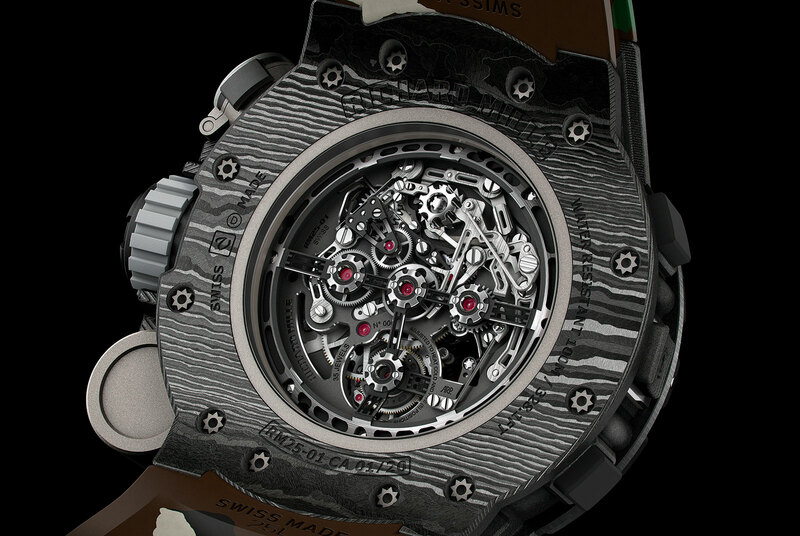 The RM 25-01 Tourbillon Adventure Sylvester Stallone is limited to 20 pieces, priced at US$983,000 or SFr934,000.